Seasoning is basically ‘build your own’ natural non-stick, and it is the reason why bare iron (or low carbon steel) cookware can become naturally non-stick without toxic and/or disposable synthetic coatings. It also helps iron cookware resist corrosion. Seasoning involves a process called polymerisation whereby oil and fat is transformed by heat and bonds to the iron, creating a natural, non-toxic and non-stick surface that you build and maintain yourself over time and can renew whenever required. A well seasoned pan is black in colour and performs very well as a non-stick cooking surface that gets better with time, cooking and appropriate care. Seasoned iron is the only known non-toxic and forever-renewable non-stick. All other non-sticks are made with toxic and/or disposable synthetic coatings. Seasoning will help you achieve your desired level of natural non-stick. It keeps renewing as you cook with fats and oils, so long as you are careful with washing. AUS-ION pans season exactly like cast iron (or carbon steel skillets and woks). It is very easy to 'build your own', if you follow our instructions (below), or find your own seasoning ritual, as the many millions of people around the world using seasoned iron already know. We recommend a combination of oven seasoning (for corrosion resistance) and stovetop seasoning (to more quickly build the non-stick cooking surface) for all AUS-ION pans. 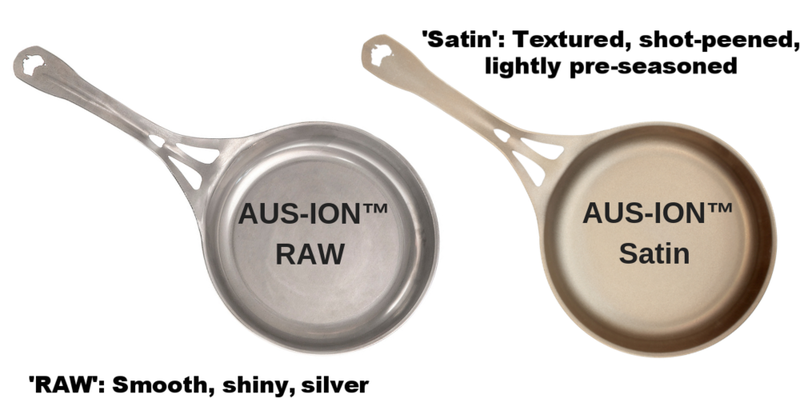 for AUS-ION™ ‘RAW’ and ‘SATIN’ wrought iron/steel pans. 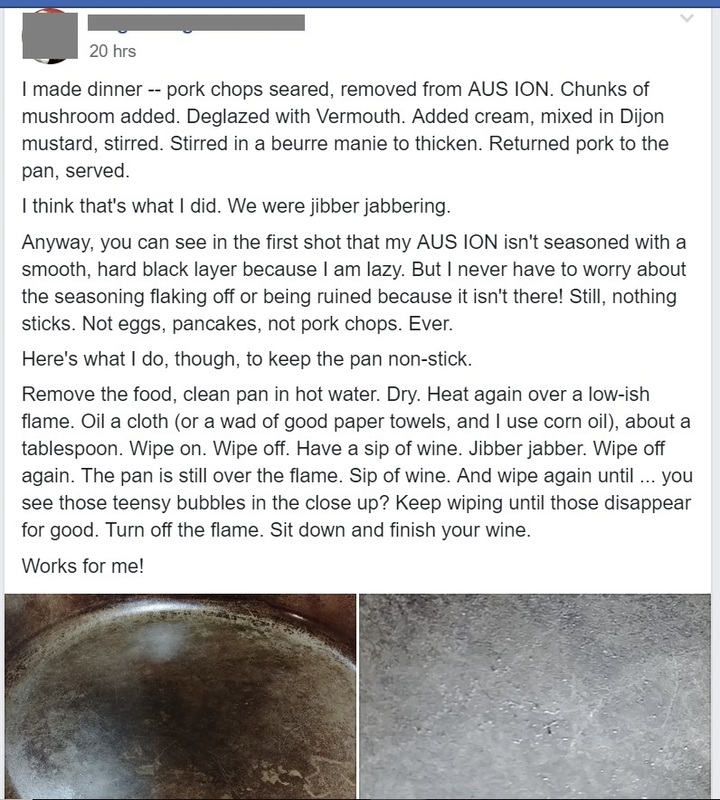 Here we show our 'best practice' method of achieving the most effective all natural, non-toxic, non-stick for SOLIDTEKNICS AUS-ION RAW smooth wrought iron pans (wrought in one rivetless solid piece, and half the weight of cast iron). This method also works very well for any smooth steel/iron pan, like French steel pans and steel woks. 2. Once your pan is wax-free the next recommended step is to ‘Key’, or roughen the surface all over to make a better micro topography for seasoning to bond to. This isn’t essential, but it can greatly improve the evenness and strength of the initial seasoning foundation layers. Abrasive pads are best for this purpose, and you can use fine sandpaper (400 or 600 grit), or fine steel wool to rough up the entire surface, including the base and handle. Don’t worry, you can’t damage AUS-ION™ - this scouring will only provide the seasoning with a better ‘grip’. 3. Now you can continue with the same seasoning steps as AUS-ION ‘Satin’ below. * Don’t worry about the wax! Removing all wax is only necessary if you want to follow our recommendation for scuffing the surface all over. Our non-toxic natural beeswax is entirely safe, and can actually help with seasoning (there are many very good seasoning sticks made from a mix of beeswax and oil, and we love them). If you would like to try this method, simply heat the pan to 80°C / 180° F and wipe most of the beeswax off while you’re mixing in a light amount of your preferred oil and polishing all over until there is no visible oil. The very smooth machine-wrought finish is more sensitive than a scuffed surface to anchoring seasoning, so you need to use less oil on a preheated pan to avoid spotting/streaking. Continue with the same steps as Satin below. 1. Preheat your pan/s in the oven to 90°C / 200° F for 15 minutes. 2. Carefully remove from the oven (with thick gloves/cloth – HOT! ), and place on a heat-resistant surface. 3. With a cotton, linen (or any lint-free natural fabric) or tough paper towel, wipe rice bran oil (recommended), seed oil, canola oil, ghee or shortening over the ENTIRE pan very thinly, so the surface appears polished only (wipe on, then wipe off , leaving only a residue). Too much oil is a very common mistake, the pan will look like there is no oil left on the surface, but be assured there is (the pan should look dry, not glistening with oil). Polishing the oil on while the pan is hot is the best way to avoid using too much. Even if you think you applied very little, cold oil will soon run and bead up when pan is heated. Too much oil is one of the most common causes of weak, sticky, flaking or otherwise problematic seasoning (when the oil is too thick to properly transform/polymerise into hard inert seasoning, it will leave weak sticky patches). Place skillet/s upside down in oven for 1.5 hours. 4. Turn oven up to 250°C / 480° F, and Place skillet upside down in the oven for 1.5 - 2 hours. 5. Switch off the heat and leave the skillet to cool in the oven for at least 30 minutes, or ideally overnight, before opening the door. 6. Repeat above steps two - three, or more times, if possible, to establish the best seasoning foundation for corrosion resistance, and further stove top seasoning. Our Solidteknics AUS-ION ‘Satin’ pans do come lightly pre-seasoned, but they need further seasoning after purchase to avoid rust and maximize the natural non-stick you can build yourself with simple seasoning and washing maintenance. Here we will show around 10 minutes of stovetop seasoning action sped up to show you how easy it really is. A well seasoned pan is black and you will see your pan naturally darken before your eyes as progressive layers of seasoning are applied. 1. Heat skillet slowly to hot on your stovetop (remembering that you don’t need a high stovetop heat to get a hot iron pan*), drop in a teaspoon of one of the seasoning oils mentioned above in step 6 and wipe the inside surfaces with a paper towel (held in tongs for safety). 2. Continue wiping for 20 seconds as the skillet smokes. 3. Oil should be a very thin polish - no pools or lumps. 4. Remove from heat and cool for at least 1 minute. 5. Repeat this process for 10-15 minutes over two or more sessions, until the base is black, slick and oil repellent, or until you are satisfied with the pan’s non-stick performance. SOLIDteknics founder/engineer in Paris cooking with old food friends, led by Paule Caillat of Promenades Gourmandes. Paule had a new pan she wanted seasoned in a hurry, so Mark took care of that with the chef's stove-top seasoning method while everyone cooked. 3. * Avoid overheating your iron pan on the stovetop while it is empty, and allow it to cool adequately between seasoning layers. While stovetop seasoning and cooking it is important that the burner is well matched to the pan size. Iron naturally expands when heated and although our pans are carefully designed with the correct amount of concave to compensate for that movement, there may be uneven movement if you are using large pans on small, high powered / high temperature burners when the centre of the pan will move a lot more than the outer edges. There may also be issues if an empty pan is left on high heat for too long and such misuse can lead to warping or deformation of the base. Old-school seasoning while you cook: Continue to build your non-stick, natural, seasoning foundation by cooking with fats/oils. Boiling liquids and acidic foods like tomato, lemon juice and vinegar can all erode oil based seasoning. To remedy, repeat the seasoning processes above as required. Natural seasoning is forever-renewable. 1. After cooking, run the skillet under hot water. 2. Never place in a dishwasher - these skillets are for hand-washing only. 3. Use a wooden or steel scraper to remove food residue. No soap needed! Use a brush if necessary though be careful with the beautiful black seasoning you have achieved! 4. Wipe with a towel or paper cloth to dry while the skillet is still warm. 5. Place skillet on stove top and turn heat on low for a final dry if needed. Ensure that your pan is completely dry before storing it away. If you’ve washed your pan and you are drying it out on the stove, why not do a single stove top season while you’re at it? That’s a great way to quickly build up or replenish your seasoning as you go. If you don’t have access to an oven or hooded BBQ, or for pans too large for your oven, use the stove top seasoning method above and protect the non-cooking surfaces with a very light coat of oil between uses. 1. Once a pan is well-seasoned, cleaning can be as easy as wiping out with a paper towel. 2. If your pan develops rust spots, gently scrub them away. Keep cooking or spend a few minutes stove top seasoning as per the instructions above. 3. If your seasoning works a little too hard with acidic foods or high heat, you may notice some dark residue on your towel when cleaning. This is perfectly safe and normal and will go away with regular use and care. We recommend the use of a dedicated ‘iron pan’ tea towel that you don’t mind getting a bit dirty - or use paper towels. 4. Enjoy the pride in building your own healthy, natural, non-stick, innovative 100% Australian-made iron skillet! We don't want you to miss all the fun going on in our wonderful Solidteknics Cookware Lovers (private) Facebook Group Community: lots of cooking, recipes, and advice for anyone new to cooking with our highly conductive seamless iron and stainless steel cookware. Contact the Solidteknics Australian team via email info@solidteknics.com if you have any questions! Happy Cooking! If the seasoning on your pan is sticky, this is a sign of excess oil building up and not fully converting to seasoning (too much oil, not enough heat or not enough time exposed to the correct heat). To remedy this, place the cookware in the oven, upside down on the top rack and bake at 250° C degrees for 1.5 hours. Allow to cool and repeat if necessary. Enjoy the pride in building your own healthy natural nonstick on an innovative AUS iron pan that will last for many generations, with a little of this kind of care. ♥ FAQs are addressed here toward the bottom of this page. · Oven burn risk: Take care when handling any hot metal pan, especially when taking from oven, and use oven mitts to protect your hands and trivets to protect surfaces. After removing from an oven we recommend leaving the heat sock, mitt or towel over the handle to remind yourself the handle may still be hot. Induction warping: Our iron pans are so efficient with induction that heat can become too concentrated in the middle, particularly when mismatching induction ring size to pan size. Because our AUS-ION wrought iron pans are so efficient on induction, there is rarely any need to go above medium power settings. Small rings and high power can certainly warp any pan, and though ours are tougher than most, it is possible to ruin your pan through warping. The issues can be exaggerated with some high power or very centrally-focused induction. Like other situations of 'abuse', warped pans from overheating on induction are not covered under our warranty. Yes, we know it all sounds a bit weird for anyone brought up on synthetic nonstick. The thing is, we didn’t invent natural seasoned nonstick on iron pans. It’s been done for over 2,000 years (since the first hand-wrought iron pans), up until two generations ago when the industrial marketing machine sold us synthetic nonsticks. Now that everyone knows they’re all toxic and disposable, there’s a scramble to find a ‘new’ solution for something that has always been there: simply build your own nonstick on iron! Below is a small sample of the many posts we see from Solidteknics supporters who take pride in building your own non-toxic forever-renewable nonstick. Yes, it is a small sample, but we have 100,000+ happy customers like these, and that is a small fraction of the millions of happy cooks around the world cooking on seasoned cast iron, carbon steel, woks, etc. There’s a bit of a learning curve, and some work in the beginning, but once you know you could never go back to toxic disposable cookware! Some of the best customer seasoning advice we’ve ever seen…..